I recently was chatting over email with fellow Westchester blogger – Phyllis and was quite amazed and impressed by all the culinary greats that she has worked with. She has actually learned Indian cooking from Madhur Jaffrey, she describes this beautifully with some recipes in this post. When I think of Madhur Jaffrey, I think of a person who before the likes of Suvir Saran, made Indian cooking accessible in her own right. 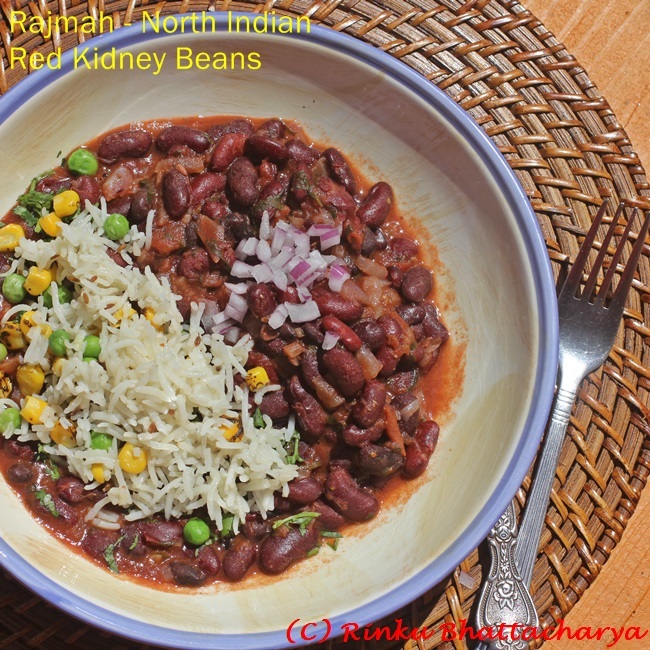 Simple, home style dishes like Rajmah or Red Kidney Beans mostly in the north Indian tradition of cooking, a style of cooking making a comeback. People are indeed more interested in simple home flavors, just like I am interested in simple, sustainable Indian flavors. Lentils and legumes are such a core part of this equation. Well, possibly one of my first Indian cookbooks were by this grand dame of Indian cooking Ms. Jaffrey. I could not actually find it today. 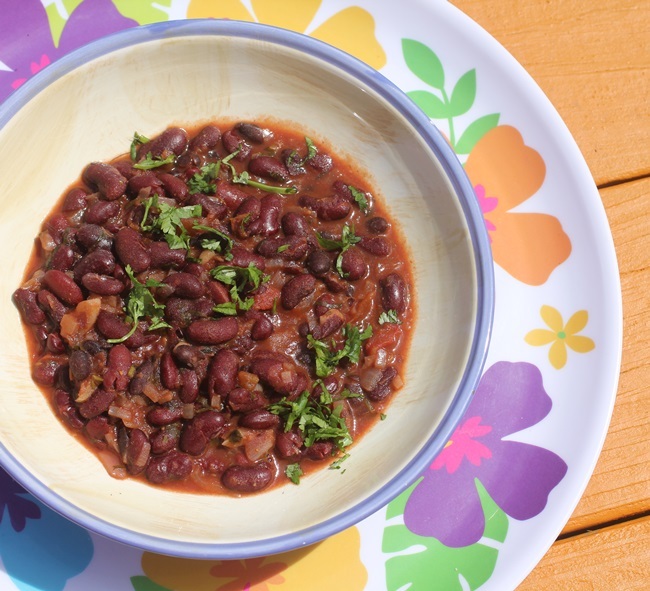 I made these kidney beans – Punjabi Rajma, inspired by memory. Over time, although I have modified this dish to make it closer to my mother-in-law’s recipe, this I share with you in the Spices and Seasons, Cookbook. I do know that here recipe called for two things that I did not do, the first was to add cream and the second was to simmer the beans for 3-4 hours, hey, that is why I have a pressure cooker…. Now, little did I know when I first made this, that it is North Indian comfort food at its best. I have since then made this so many times that I have sort of put my own stamp to it. It never fails to please on a cool day. A simple and classic North Indian dish, the Indian equivalent of rice and beans. 1. 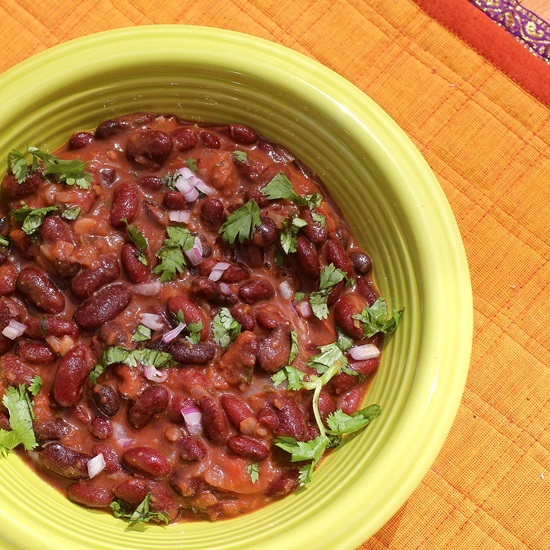 Place the red kidney beans with about 3 cups of water and cook under pressure for 25 minutes on a stovetop and 25 to 40 minutes in an electric pressure cooker. This time can be shortened by soaking the beans. Cool the beans until the pressure cooker can be easily opened. 2. Take about ½ cup of the cooked beans and blend to a puree with about 1/2 cup water and set this aside. 3. In a separate pan, heat the oil and add the cumin seeds and cook till fragrant and aromatic. 4. Add in the onion and cook on medium heat stirring occasionally until the onion in soft and beginning to turn golden (about 3-4 minutes). 5. Add in the ginger and garlic and cook for another 2 minutes. 6. Mix in the tomatoes and cook for 5-7 minutes. 7. Add in the cooked whole beans with any water, chili powder, powdered cumin and mix well. Let the mixture simmer for about 5 minutes and stir in the pureed beans and simmer for another 10 minutes until the mixture is thick creamy and smooth. Turn off the heat. 8. Cut the lemon, remove any seeds and squeeze in the lemon juice. 9. Garnish with the chopped cilantro prior to serving. 10, This dish is typically served with steamed white rice and any assortment of garnishes, such as diced red onions, radishes or carrots. Spice Chronicles is about inspired Cooking from a New York kitchen. It is an attempt to bring you fresh, clutter-free, vibrant, spice enhanced dishes with a touch of the Hudson Valley. Years ago, I was determined to ensure that family meals did not get into a boring rut to cater to the daily rigors of practical living – work, school, life as we know it. This site is a personal effort at chronicling the recipes that I created. It also showcases our small commitment towards reducing our family carbon food print. There is more about me and how the family fits into the equation on this page and all about our little curry garden, here. Like most of the good cooks in my life, most notably my grandmother and mother, my cooking is very practical and approachable.